Welcome to the wonderful world of Bohemia. We are the girls that wear fringe, boots, and headscarves. We walk barefoot, we love wholly and we dream big. Check in daily to see what is happening in our world – the fashions we heart, the people who inspire us, the food we love and the fun giveaways we do. We believe in our manifesto and we love our community. 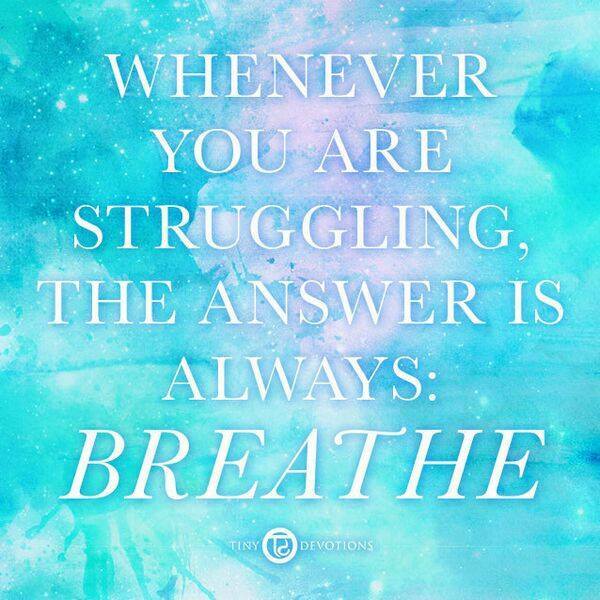 Inhale, exhale… Grab your mat, blankets, bolster and blocks. Find a comfortable seated position with a straight spine rooting yourself into the mat. Gently close your eyes or soften your gaze allowing yourself to dive inwards. Take a moment to choose your mantra to guide you through your meditative practice. What brought you to your mat today? What intention did you set this morning when you awoke? 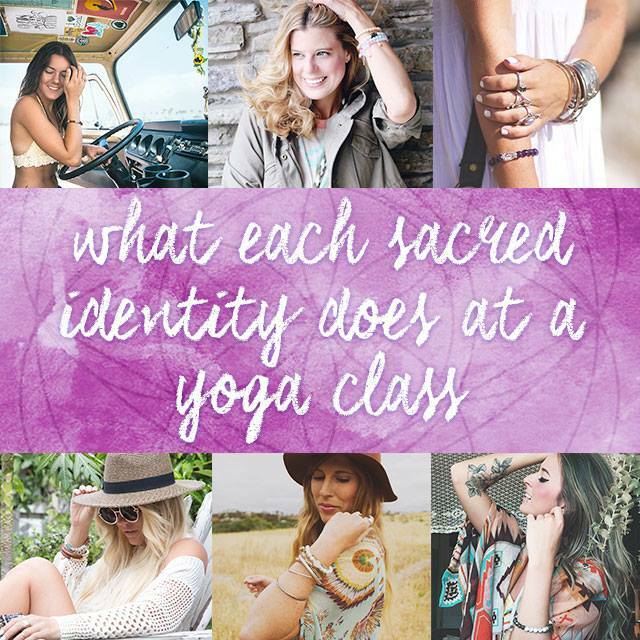 What emotion does your mala evoke within you? Your intention is personal to you- it can be a thought, a word, a sentence or song. Once you have chosen your mantra chant it aloud or silently. Hold your Mala Beads in your right hand allowing it to drape between the thumb and middle finger. Starting at the Guru Bead or the sacred stone- gently roll each bead while repeating your mantra. Repeat this 108 times, or until you are back at the sacred stone. Place your Mala beads at the top of your yoga mat. Allow your mantra and intention to flow through you guiding you through your asanas. If you feel yourself getting lost in the physical practice, use the intention you set with your Mala Beads to bring yourself back to the present. Finish your yoga practice on your mat with a juicy savasana. You may choose to end with another round of Japa Meditation bringing your practice full circle. Mala is the Sanskrit word for garland. While simply being in the presence of these Mala Beads or Malas as they are called for short is powerful, these magical beads are commonly used in the spiritual practice of Japa Meditation. Malas have 108 beads to count while reciting, chanting, or repeating a chosen mantra or intention. They are also deeply devotional and can be used in the repetition of sacred names or words like Om, Om Shanti Shanti Shanti, I am Love, I am Peaceful, etc. When we select a word or series of words to repeat in the form of a mantra, we’re affirming it to ourselves, allowing its meaning to sink below the surface into our subconscious, helping to shift negative vibes into positive ones. Simply the practice of asking the universe for what you want is the first step to making it into fruition. intentional statement piece, inspiring their wearers to connect deeply with their inner being. They are known for their unique appearance, vibrational healing properties and ability to serve a daily reminder to live a more intention based life. Our Malas have 108 beads, made out of Rudraksha seeds, Sandalwood or Rosewood, plus one guru stone made out of a beautiful crystal known to have many healing properties. The 109th guru stone symbolizes gratitude and our connection to the divine. It is a way to say thank-you to all the yoga teachers, friends, family or guides who have helped us on our path to enlightenment (or at least knowing ourselves more). We also use the Gemstone Guru to set specific intentions and goals. Mala beads can be used in a variety of ways to help you manifest and achieve your dreams + desires. Our NEW Meditation Mala Collection features 6 Malas, each designed to keep you focused and on track during your practice on that specific intention, affirmation or mantra. Originally used for japa meditation, mala beads are a great addition to any modern meditation practice. Wear your mala around your neck or clasp it firmly in your palms as you tune in and focus on your breath. You can also bring your mala beads to your mat during your yoga practice as a way to focus and bring awareness to your intentions. This is a great way to infuse your mala with the energy of your practice. We recommend placing your mala beads on the corner of your mat and using them as a focal point during your practice. Instill a calming, patient peace of mind. Perfect for those who find it difficult to have patience and trust in the right timing. In the midst of noise and hard work, you still carry calm within your heart. Bring forth an energy that is courageous, confident and full of strength. You are independent, intelligent and capable of whatever you put your mind to. Keep your vision on what’s ahead, and let go of thoughts that don’t make you strong! Your inner strength is radiant. You are a strong, confident, and vibrant beacon of light; a magnet for all that is good. Share your wisdom. Radiate love. Your intuition is your soul speaking, and it knows your truth. Trust your own voice, and believe in your heart. See with your own eyes, speak your own mind. Awaken your conscious mind, provide inspiration + assist in personal development. You see the light in everyone and everything. Your spiritual vision is clear. Awaken your truth. Appreciate life, freedom + love. Take the sweet shortcut to finding peace of mind and happiness inside. Wear this Mala to enhance abundance, acceptance and appreciation. We’d love to hear how you use your mala beads for meditation. Comment + Share below. Friendship is kind of like a party. Your energy draws people in. BFF’s that are always down for an adventure, sisters to soul speak with, besties that light a spark within us + a tribe to keep us grounded. Friends make us smile + allow us to be our authentic selves. They will forever hold a special place in our hearts. Volunteering with senior citizens and disabled adults at a nursing home made me realize the importance of valuing each moment – each day that we wake up healthy and free and surrounded by friends and family. It makes daily annoyances and minor issues seem really petty! Exploring not only everything this beautiful world has to offer, but also exploring what you are capable of. Wake up, have no plan at all, get lost in foreign spaces and discover new things. Traveling has taught me to take nothing for granted. To stop, take a minute and appreciate everything around you. $226.00 Winter Wellness Skincare Set from OSEA! ALL orders placed Wednesday, December 9th, 2015 are entered in to win this grand prize! There will be ONE grand prize winner. Daily prize winner to be contacted by e-mail. The Boho Child (ENFP): Becomes besties with everyone around them in 5 minutes or less. The Shaman (INFP): Calmly lights sage sticks ? cleanses the space. The Truth Seeker (ISTJ): Just here for the Savasana. The Yogi (ESFP): In the corner concentrating on nailing that Handstand Scorpion. The Guru (ENFJ): Making friends with first-timers and teaching them the moves before class even starts. The Life Coach (INFJ): Hosts a counselling session in the bathroom. The Goddess (ESFJ): Calmly people watches ? learns. The Light Worker (ISFJ): Walks around helping classmates nail down their poses. The Gypset (ISFP): Crushing on the hot dude beside her. The Risk Taker (ESTP): One-Handed Tree-Posing. The Student (ISTP): Takes the advanced class on their first go. The Warrior (ESTJ): Makes slightly inappropriate jokes for anyone who will listen. The Planner (ENTJ): Somehow networks the entire class and wakes up with ten job offers. The Creator (ENTP): Secretly wishes she was teaching the class. The Sage (INTP): Accidentally wandered out of class and ended up in another town. The Manifester (INTJ): Takes scheduled hydration breaks and basks in their happy place. Take the quiz here to find out, and share your results below! Belly breathing is easy to do and very relaxing. Try this basic exercise anytime you need to relax or relieve stress. 1. Sit or lie flat in a comfortable position. 2. Put one hand on your belly just below your ribs and the other hand on your chest. 3. Take a deep breath in through your nose, and let your belly push your hand out. Your chest should not move. 4. Breathe out through pursed lips as if you were whistling. Feel the hand on your belly go in, and use it to push all the air out. 5. Do this breathing 3 to 10 times. Take your time with each breath. 6. Notice how you feel at the end of the exercise. “It’s not having what you want, but loving what you got.” Sheryl Crow said it best! Contentment is all about living in gratitude – not focusing on possessions and the awareness that happiness through materialism is only temporary. The niyama of tapas is all about self-discipline and will power! Doing something we don’t want to do but that we know will have a very positive effect on our life : going to the gym when we’re tired, making that healthy salad when its easier to just get takeout, saving the money instead of spending it on the new dress – you get the point. The tapas or fire energy that is built up during disciplined actions is strong spiritual energy that is believe to burn up karma and impurities. 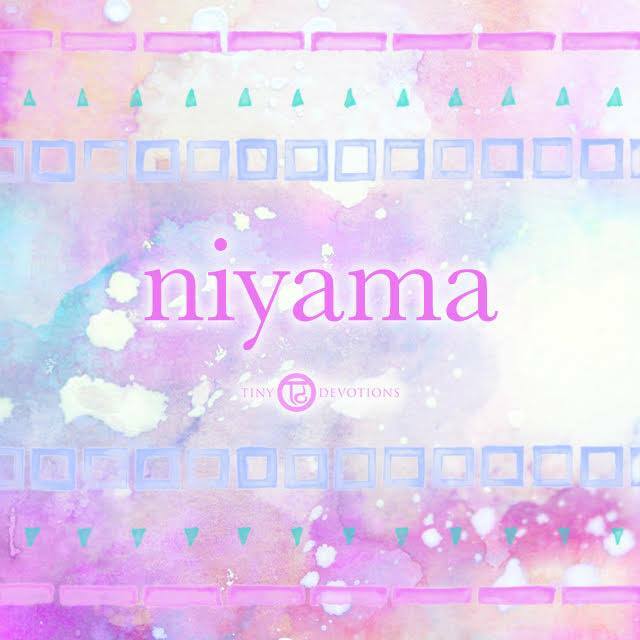 The last niyama is all about surrender to the divine. A higher power – the universe – whatever you want to call it. This niyama is all about being selfless and devoted to something outside of yourself. You can practice this niyama by: dedicating you yoga practice to someone else, letting go of a “desired result”, and letting situations unfold instead of forcing direction. 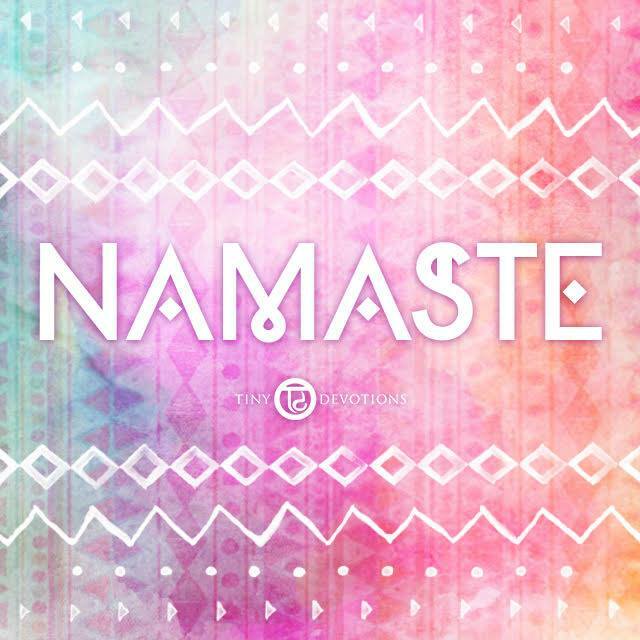 Namaste. May the beauty, the gorgeousness, the light, the strength, the power, the source, the gratitude, the wisdom, the love in me acknowledge that in you. It’s a greeting, its a farewell, it’s a way to enter, a way to close. Headed to a yoga retreat this fall? 1. RMS Beauty + Ilia lip gloss, Vapour Beauty Aura Multi-Use Blush. Gorgeous organic, cruelty-free make-up. 2. 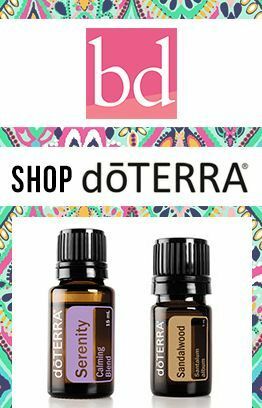 Peppermint + Lavender essential oils (I love Doterra). Great for a pick-me-up or calm-me-down. 3. Quay Sunglasses from Australia… they’re so chic even when I’m a sweaty mess. 4. Digest Gold digestive enzymes from Enzymedica. Especially helpful when I’m on the road. 5. Oblas inhaler. Helps my allergies and feels great. 6. See Concept reading glasses. Stylish and flexible. 7. My iPhone 6+. I’d be lost without it. 8. A book. Currently reading Misty Copeland’s memoir. 9. My Tiny Devotions Aim True Mala. A reminder to not only keep your aim true, but to stay true throughout it all. 10. 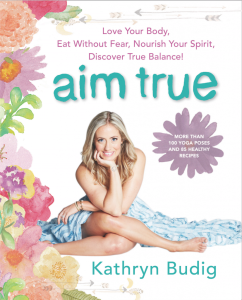 Aim True, my new book about loving your body, nourishing your spirit, and discovering true balance. She’s a yoga teacher + life coach, as well as a lover of avocados, French press coffee, hip hop, Mala Beads and dogs – especially her lovable English bulldog Rosy. 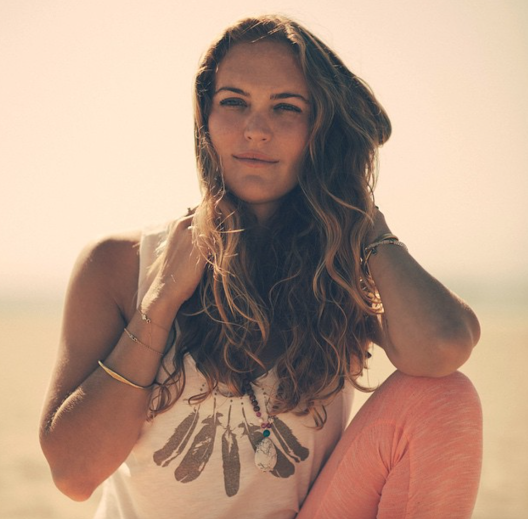 Mary Beth Larue is the co-founder of Rock Your Bliss a yoga + goals movement inspiring and empowering others to live their yoga both on and off their yoga mats. We caught up with MB to find out whats in her bag! my iPad mini: My husband surprised me with this gift last Christmas and I carry it with me everywhere. It’s chock full of all of my favorite music (Lapsley, Erykah Badu, Bonobo), my favorite books (anything by Byron Katie plus a billion other books) and notes for my classes, retreats, blogs, etc. It’s a creative Virgo’s dream come true! Stinky Yogi’s Pranayama Blend: I am obsessed with this blend of essential oil by my girl Stacey. The blend is peppermint, eucalyptus, rosemary and lemon. my red, tattered, so-loved Moleskine notebook: Oh man, this notebook has been loved up. It’s full of class sequences, musings, to-do lists, etc. I love looking through it. And the back pocket is stuffed with notes, things ripped out of magazines, etc. my Ganesha keychain: I’ve had a Ganesha keychain in my bag for 9 years and have lost it several times and always find it. Ganesha is a Hindu deity and the remover of obstacles and I like to think that he’s working for me all the time. 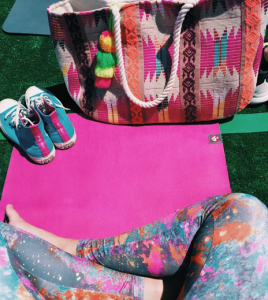 Grab your gypset tote and hit up Rock Your Bliss’ next retreat! Copyright © 2019 Tiny Devotions. Design by The Darling Tree.